From time to time I mention the theme I like de jour – but my most abiding love affair with a theme is Frugal Theme – now replaced with Catalyst Theme – and I like them both! (Well sort of replaced I haven’t got around to doing this site yet – its still in the “not broken – haven’t fixed it yet”) pile. 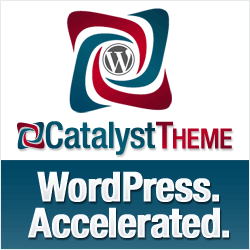 But with the release of Catalyst v1.1 I am pretty darn impressed and even WordPress 3.1 is appearing to be stable enough to upgrade to – so here’s my first Catalyst Theme Tutorial. So how is Catalyst for SEO – well its pretty good – its flexible, it won’t do it for you – but you can set and forget it. First if you are already using a plugin such as All-In-One-SEO or Platinum SEO – then you can keep on using them, they play happily with Catalyst 1.1. However if you are starting a new site – you can probably skip the plugins and just use Catalyst’s built in SEO. Once you’ve installed Catalyst and the Dynamik child theme – you will have a Catalyst Sub Menu on your main WordPress menu and under that three options: Core Options, Dynamik Options and Advanced Options. Go to Core Options and Chose SEO (if you are using a SEO plugin at the top of the page will be a warning telling you that anything you do will be ignore). If you have a keyword rich site name then you should probably append it on inner pages – if however you have a general brand name then don’t bother. 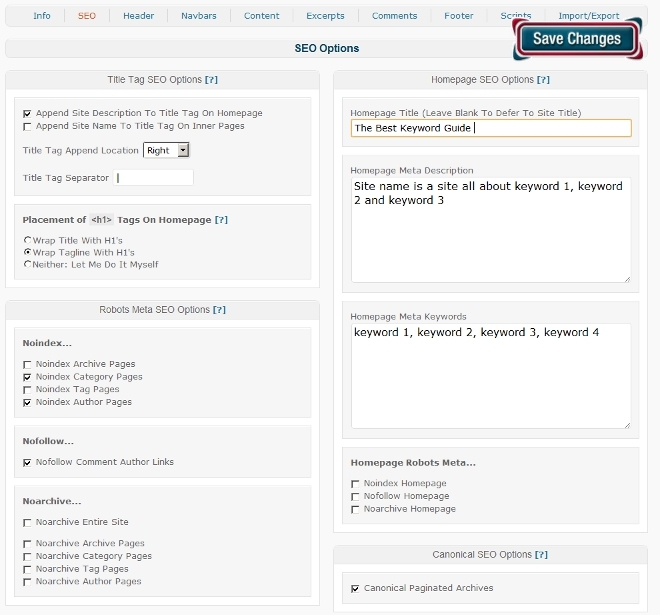 You only want ONE H1 tag on the front page – your choice whether its title or tagline. I vary on this but I never check NOINDEX on tags or archives – I find them in the SERPS too often. The author page is irrelevant on a single author blog – so I do check NOINDEX on it and sometimes on Category. If you want to have comments do-followed you can uncheck this option rather than installing the do-follow option. Homepage metadescription – is helpful friendly, something that may make someone click thru – but has lots of keywords in it too! Homepage Robots Meta – all unticked. Canonical paginated archives sounds like a good idea – to be honest I’m not exactly sure what they are though! Up to now these options will apply site wide. You can also noindex, nofollow and/or noarchive the post or page. Unbelievable! I am doing OK with Adsense. And I am not stupid technically, and I’m a woman so I can follow instructions. I have several degrees, and I can connect a TV to a digital box and a DVD player, I can waltz.. But I have never ever been able to integrate my Adsense and Analytics account until today. I have followed the standard instructions, I tried them again, I have changed themes, I have deleted and reinserted code ad nausaeum, I’ve used plugins for WordPress – nothing bloody worked! This scenario is for people who want to track more than one website in their Google Analytics account. For each website, you may have one or more profile assigned to it. Step 2 asks you to select a primary domain. Designate one of your websites as the primary domain. The primary domain requires no code changes, so if you have a site that’s large, complex, or difficult to update the code for, that would typically be the site you should designate as your primary domain. Profiles for your other non-primary domains will require a modification to the tracking code. In Step 3, you’ll see that there are no code changes required for your primary domain. 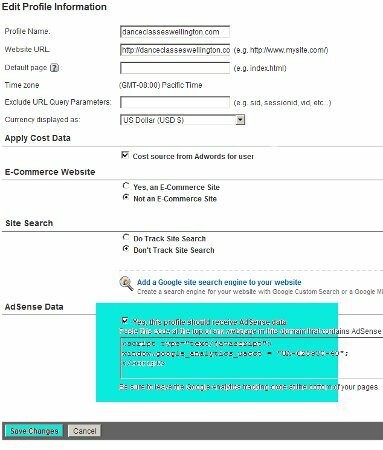 For all other non-primary domains, there is an extra code snippet, the AdSense Analytics Code, to add. The AdSense Analytics Code should be added to the top of any non-primary website that contains your AdSense ads. For many, or even most of you – this will work – but it never had for me – and I know I’m not the only one. As my Adsense income keeps going up I was getting more and more annoyed at not knowing exactly which pages and which keywords were making me money – how hard could this be, how stupid could I be? Well after yet another thread of frustration over at the TKA forums RJ from Search Engine Whisperer stepped up and said he would help – he logged into my laptop played around – changed my primary domain – and bingo it worked… but only for that domain – still couldn’t get Adsense in any of the other Analytics account. But he prompted me to look again and I found the answer – buried deep in the support forums. If you can’t get analytics / adsense integration to work – try this: (this would probably be better as a video but I don’t know how to blur bit out of video. Yes last paragraph you DO want to receive Adsense data! If you already had the codes installed on your site – then it will all work now! You probably don’t need that code provided but you MUST click on that box that asks about Adsense and you MUST save changes on this screen! 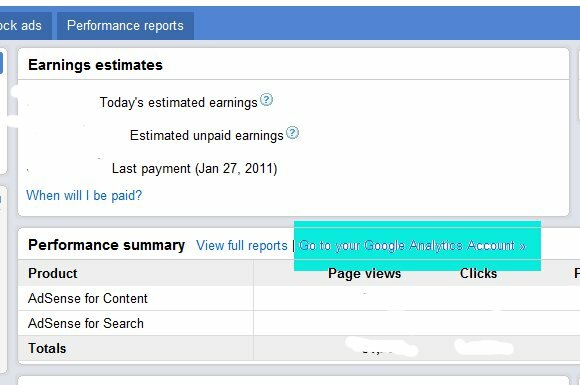 Obviously you will only see Adsense data as its collected – but as soon as you have done the above change correctly – go back into your normal Analytics reports – under Content on the left side menu you will see Adsense $$ ! 1. I’m using Catalyst Theme which like its predecessor Frugal – has a place to add header and footer scripts. Add the code from the last screen above in the header scripts and your standard analytics code in the footer and you should be good to go. click the drop down box to enable the plugin, then use ctrl-V to add the code you selected way back at the top of this tutorial (UA-XXXX-X) into the Google UID setting AND the Adsense ID setting as well – hit save. Now I know I am not the only one to have had this problem – hopefully this will help some of the rest of you… If you find this useful please promote the post using the anchored text “can’t integrate Adsense and Analytics” or similar! I’ve wasted hours and hours trying to solve this problem so lets help someone else to safe that time!